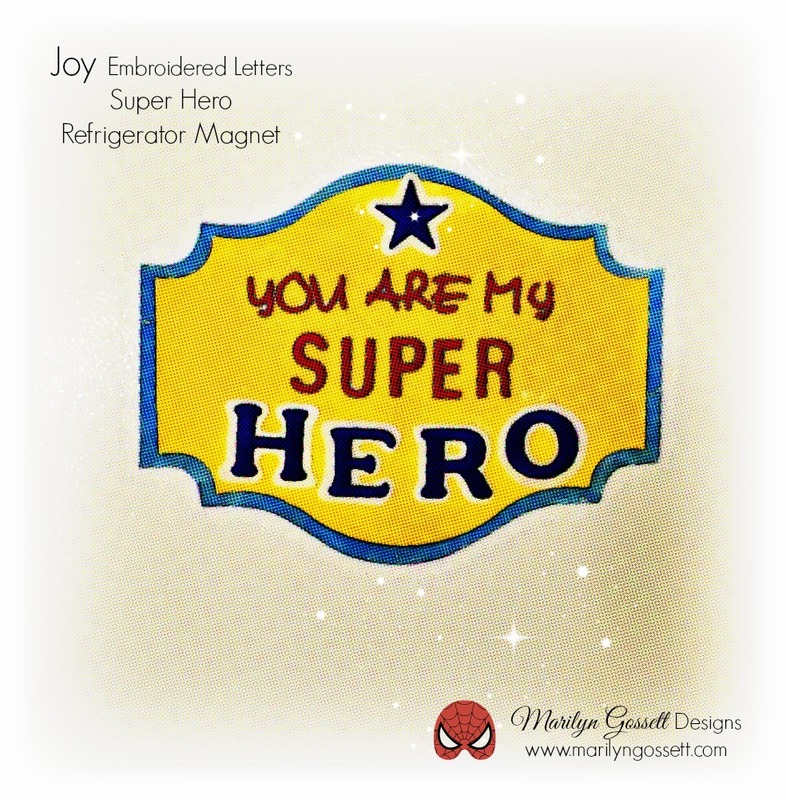 Say anything on your canvas with Joy embroidered letters! 1 yd Burlap ribbon 1/2"
1. Place the Smoothfoam on the back of the canvas within the frame. The Smoothfoam will act as a "pin cushion" when placing the quilt pins for the string art heart. 2. 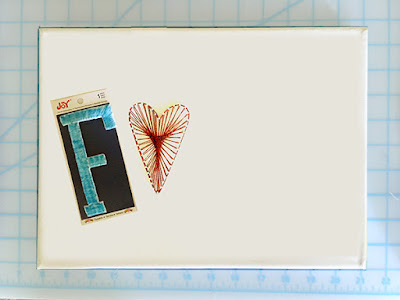 Arrange the letters and the heart pattern on the front of the canvas. 3. 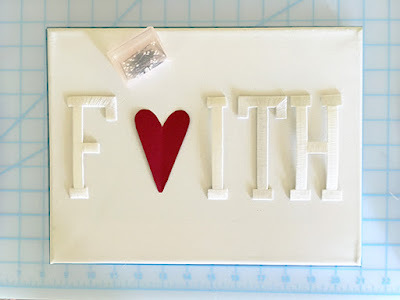 Remove the letters then push the pins thru the canvas into the Smoothfoam around the heart pattern. Smoothfoam is very dense and will hold the pins in place without glue. Remove the pattern. Starting at the bottom of the heart, secure the end of the thread to the bottom pin with a slip knot. Wrap the thread around the outside of the pins then pass the thread back and forth across the pins moving from one pin to the next pin each time. When you are back at the starting point, wrap the thread 3 or 4 more times around the outside of the heart. Tip: Wrap the thread around the "dip" in the heart. 4. 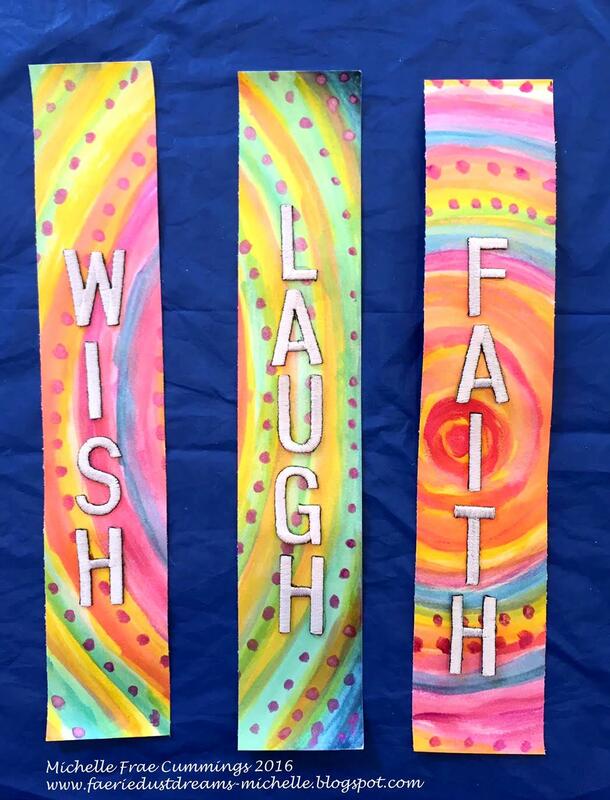 Color the letters with brush tip markers. You can also use fabric paint, spray mists, dyes, etc., but I love the way the satin thread on the letters maintains its shine when using markers. Remove the backing then adhere to the canvas. 5. 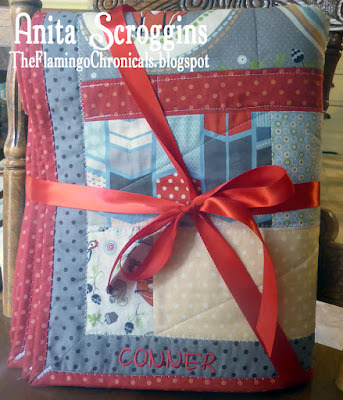 Embellish the front of the canvas with corrugated paper strips and burlap ribbon as shown. Enjoy! 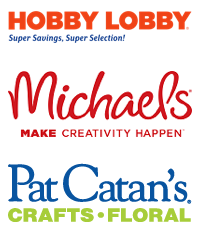 Joy embroidered letters are available in a variety of fonts, colors and sizes at your local craft stores. I love the combination of textures in this super simple autumn greeting card - the cut-out floral border with the embroidered letters and some sparkly bling. This kind of card is a great way to use your solid colors of cardstock. First I tinted my plain white Joy embroidered letters with a Copic marker. By just tapping and pressing the paintbrush tip across the threads of each letter, you can quickly and easily give your letters whatever shade you like. After cutting the front edge of my folded card with a floral border punch, I adhered a sheet of a coordinating paper inside to peek through the cut-out areas. Then I positioned the letters with clear gel glue and added some self-adhesive bling - done! 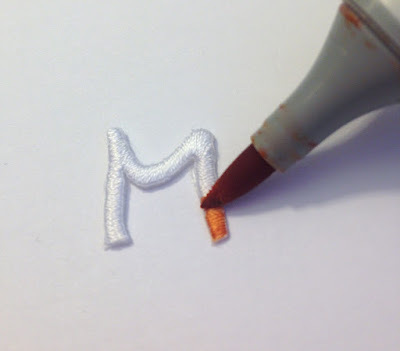 One tip for applying glue to the back of the letters - squeeze a small puddle on a piece of scrap paper and apply dots of it to the letters with a toothpick, then spread the dots into a thin coat and gently press the letter to the paper. 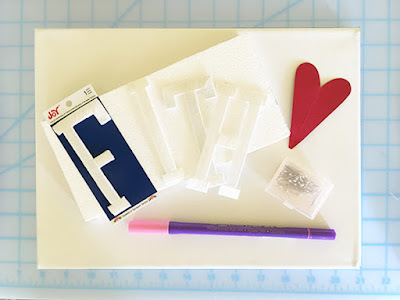 This will help you prevent excess glue from seeping out around the edges of the letters. 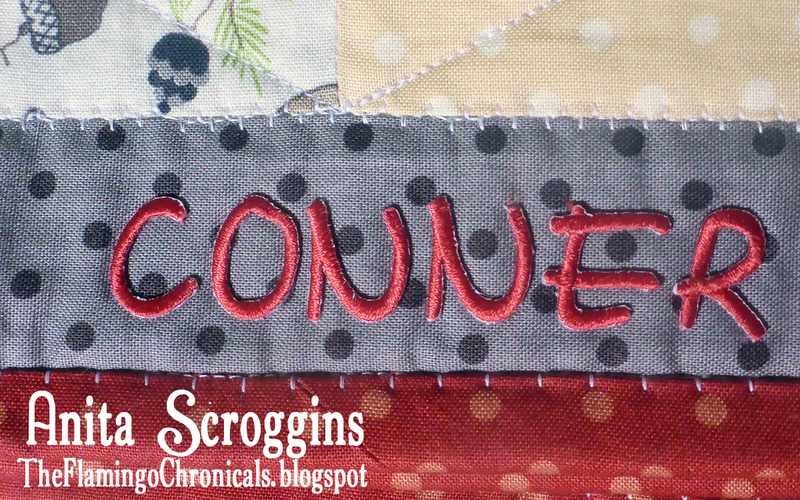 Using Joy Embroidered Letters to customize a baby or toddler quilt is a snap - much easier than trying to embroider his name onto the binding or one of the bottom squares. What little boy doesn't want a favorite blankie? Having his name on it makes it so much better. 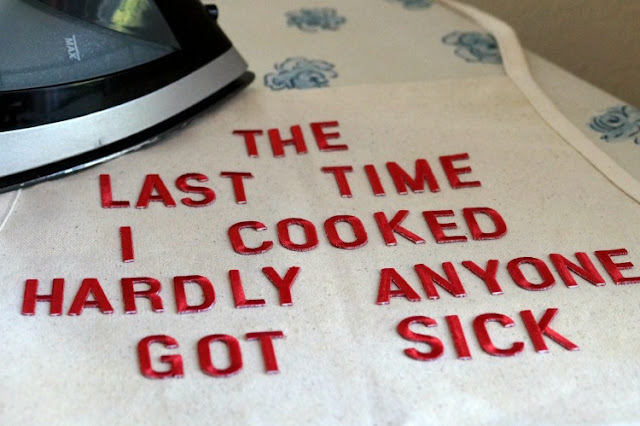 I ironed on the Joy letters in a coordinating color and ironed on the following the (the instructions can be found on the website here). Make sure to press the iron firmly for the full amount of time to ensure the letters are completely adhered. This method took only a couple minutes, versus a couple of hours if I had tried to hand-embroider it. 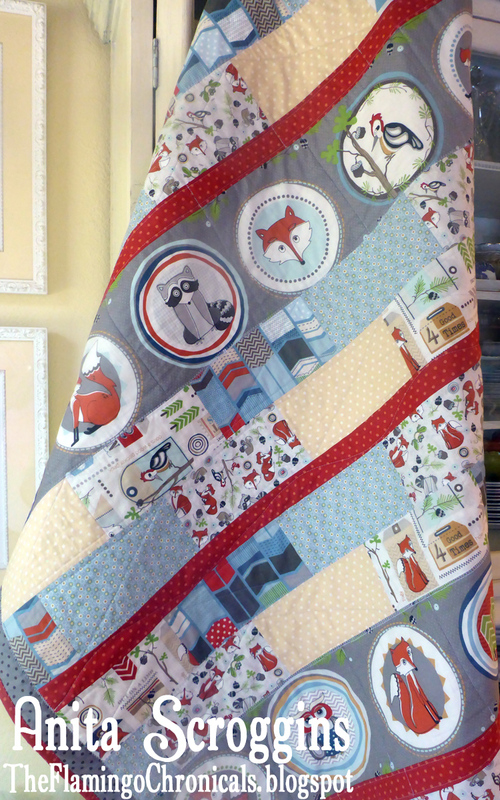 This quilt uses some of the cutest woodland fabrics I have seen in quite a while and I hope that the soon-to-arrive little boy loves it! 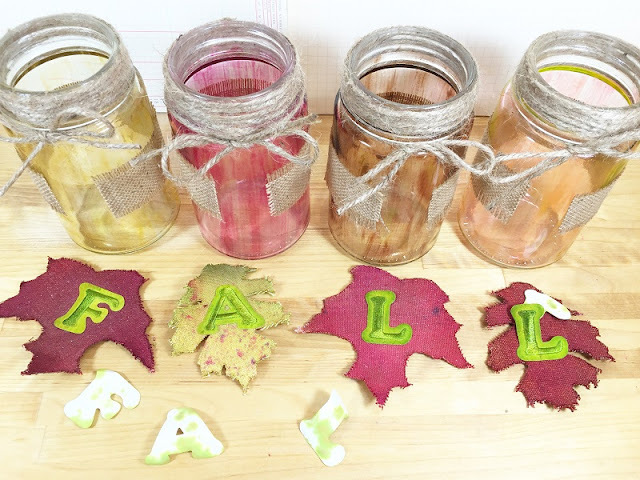 Fall is just around the corner and I love to decorate with all of the colors of the season! 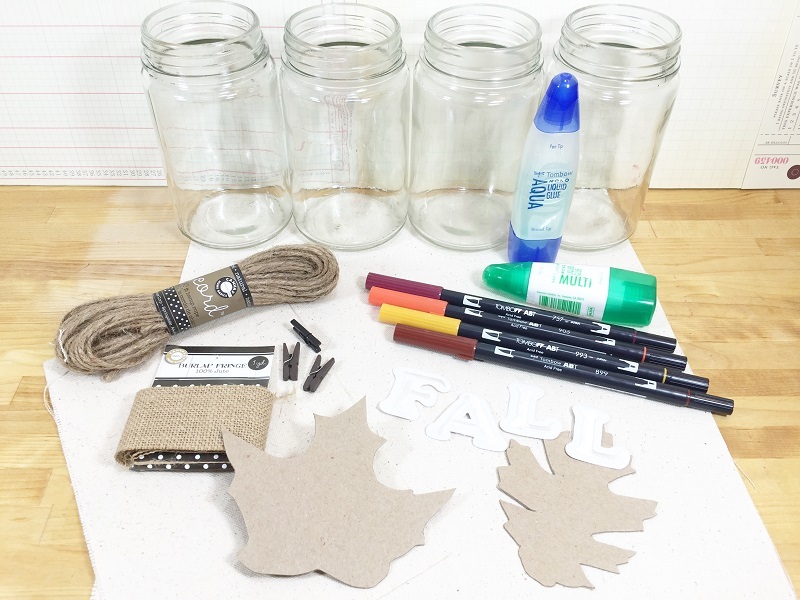 This fall-themed centerpiece made with mason jars went together in just under and hour (not including drying time), so it's a quick and easy seasonal DIY project for your home. It would also make the perfect gift for a friend, teacher or neighbor. 1. Wrap and glue the jute cord around the neck of each jar and tie a bow. Glue a patch of burlap (fringe the edges) to the center of each mason jar and let dry. 2. Color the Joy embroidered letters with spray mist. 3. Trace and cut four leaf shapes from the canvas sheet then mist with desired spray ink colors. 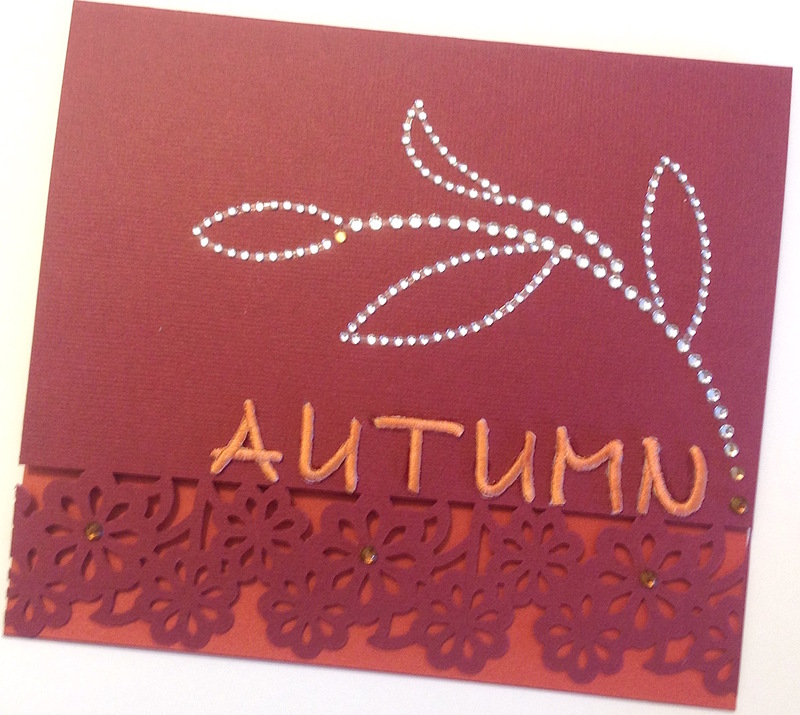 When dry, glue a Joy embroidered letter to the center of each leaf to spell "Fall." 4. Clip a leaf to the bow of each jar, fill the jars with fall foliage and it's ready to display and enjoy! 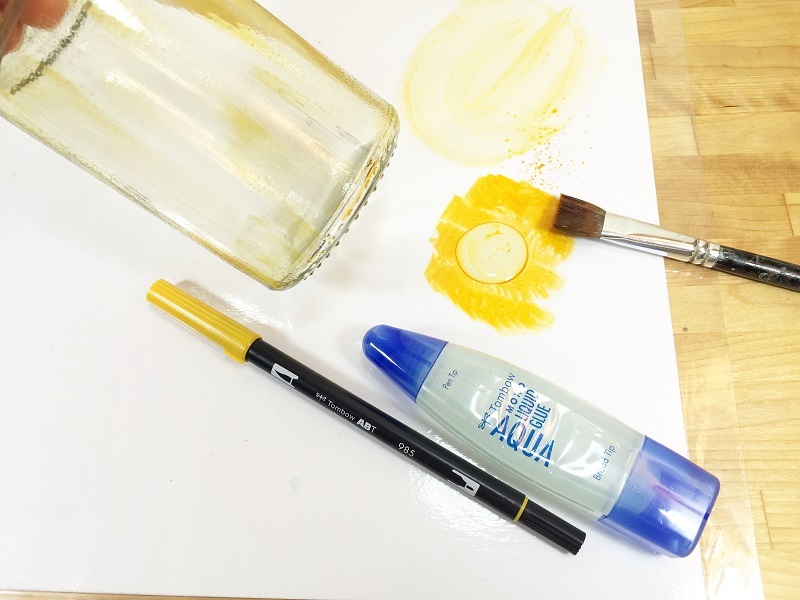 Optional: To tint each mason jar, scribble color from a pen on a non-stick coated surface. Mix in a bit of liquid glue, then brush an uneven coat of the ink/glue mixture on the outside of the jar and let dry. A new school year means a new look for everything, including your cell phone. Don't let your teen's phone look like everyone else's - give it your own flair with JOY embroidered letters! I found this cell phone case at the dollar store. 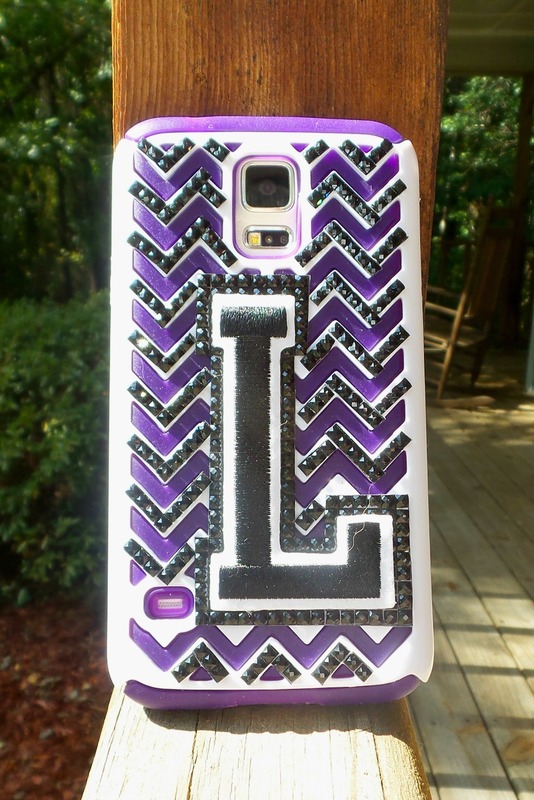 The purple chevron design was cute, but it needed more bling. 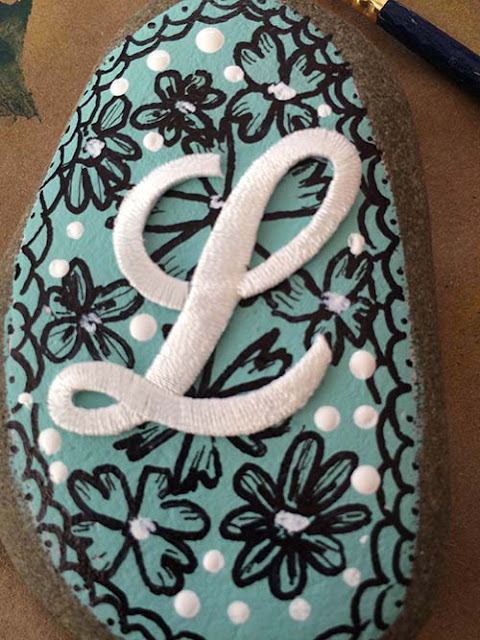 So I glued on a monogram letter and some self-adhesive black rhinestones to give it my own special touch. Quick and easy! I love to read - novels, magazines, cookbooks, even my old journals! But I never have enough bookmarks to hold my place so I can bounce back and forth between books. 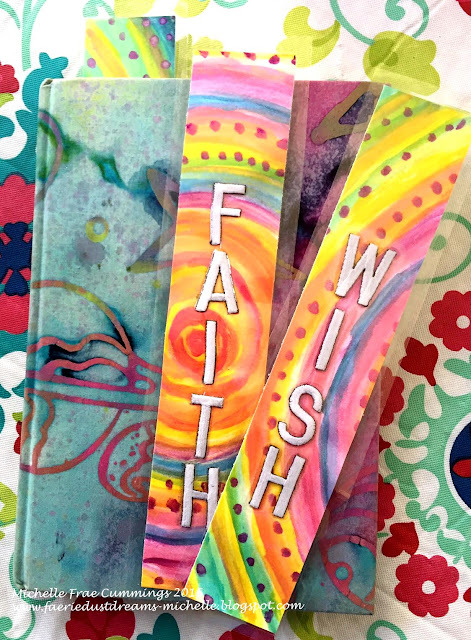 These custom bookmarks were a breeze to make, inspiring me with their words and vibrant colors! Trim your patterned paper to 2" x 8". 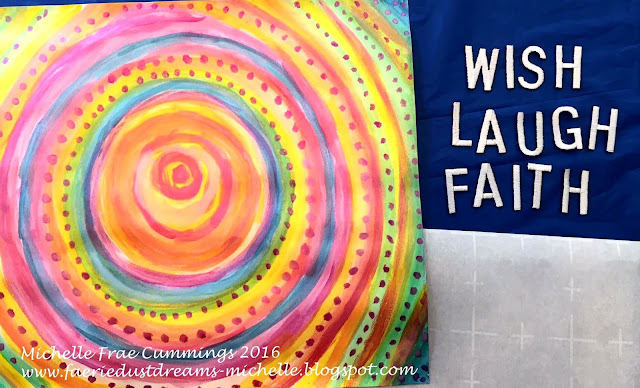 I used a pretty watercolor background paper that I painted, but you can use coloring book pages, scrapbooking paper, even photos! Position your words on each bookmark. Secure letters with just a dab of glue to hold in place. 3. Cut laminating sheets to be larger than the bookmark - 2 pieces needed for each. 4. Peel backing from sheets and carefully sandwich bookmark in between. 5. Place between parchment papers and iron evenly, smoothing in between letters until entire bookmark is sealed. To 'vacuum' seal your bookmark around the letters, you'll need to use a hot laminating machine instead. 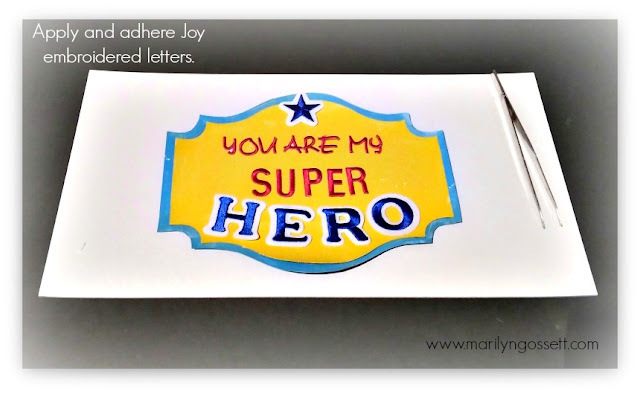 I have a Super Hero - my husband! I think he needs to be reminded once in a while with a badge of some sort. Do you have someone you would like to honor? Make them a refrigerator magnet! 1. Place the magnetic sheet on the die-cutter mat. Set the dial to maximum pressure and preferably use a deep-cut blade. 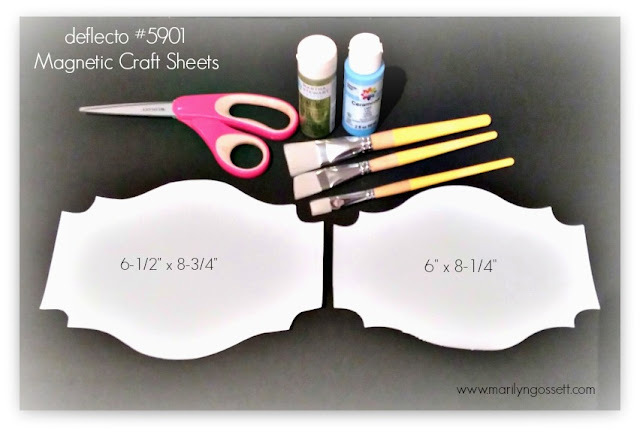 After cutting two sizes of the same shape, gently fold the magnet sheet on the cut lines until it breaks open and carefully push out the shape. 2. Paint the white side of the larger bottom shape blue.You don't need to paint the entire surface, just around the border. 3. 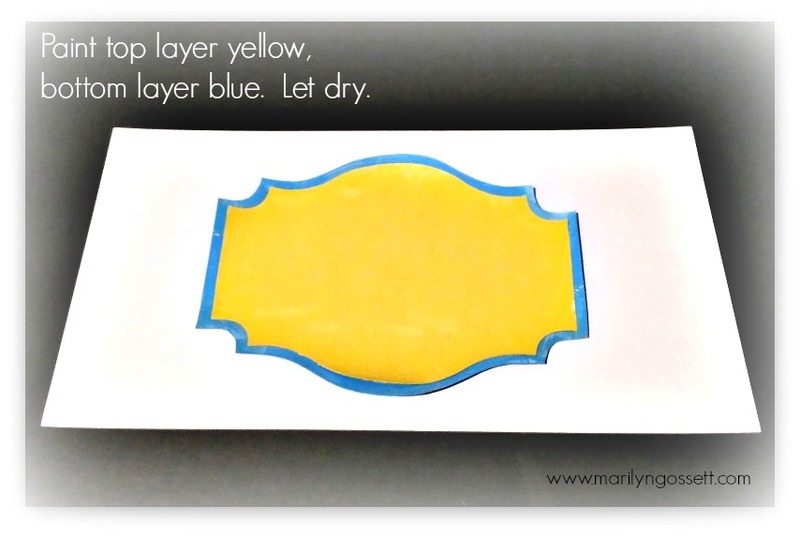 Paint the white side of the smaller top shape yellow. Allow both to dry thoroughly. 4. Center and glue the top shape to the bottom shape. 5. 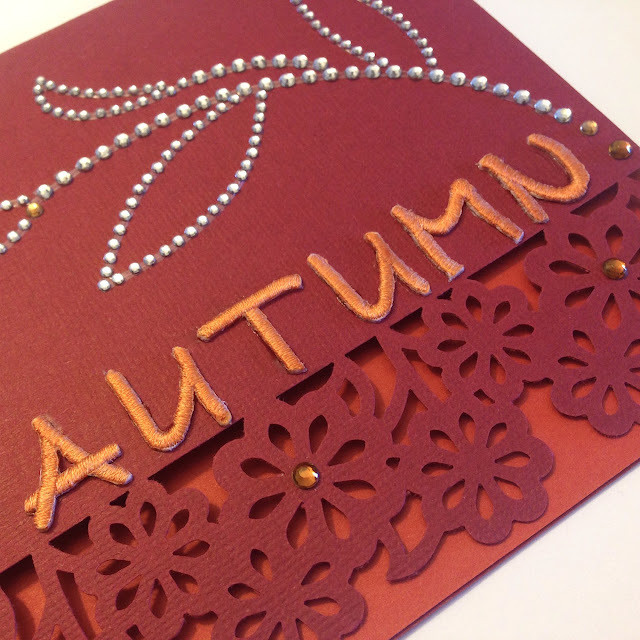 Position the letters and other embellishments as desired. I used a long tweezers to help pick up and place the letters. Use a strong tacky glue to adhere everything. Once the letters are dry, it's ready to place on your fridge, file cabinet or any metal surface. Here's why I love the new chef's apron I just made. For some people, cooking defines them. I am NOT that person. Ask me to bring chips and soda to a potluck and I'm totally fine with that. 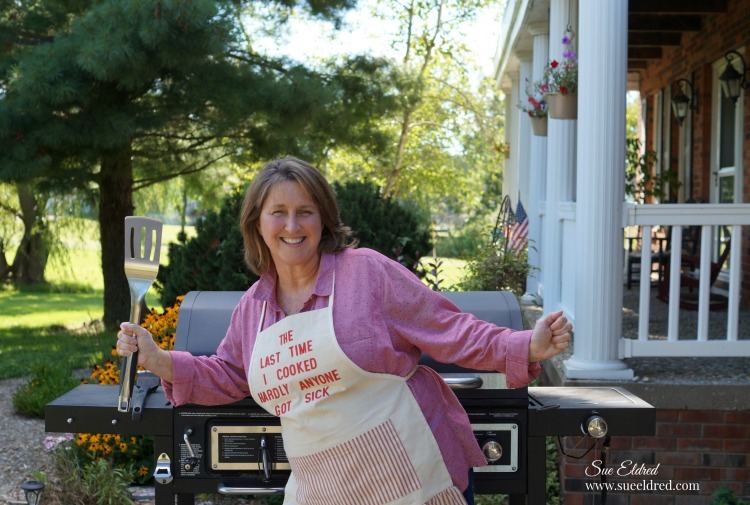 But don't let this apron fool you...it's not that I can't cook. I just don't like to. If I had a personal chef, I'd be one happy girl. But since I've got to do it, I might as well have a little fun (and keep those expectations low). This apron should do the job. 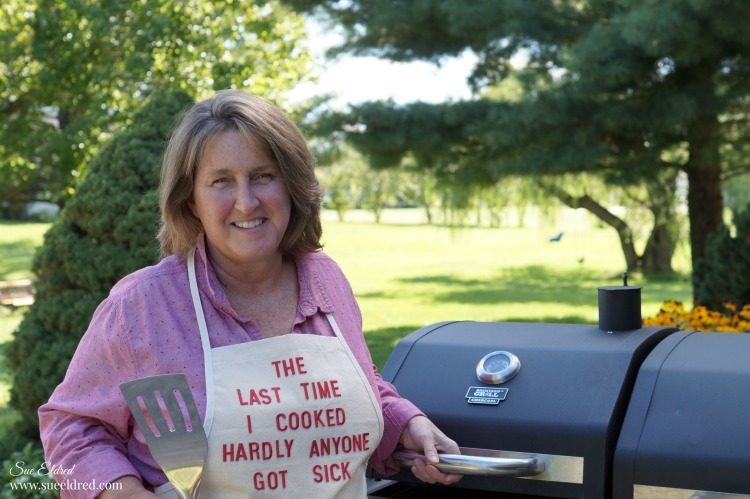 It’s quick and easy to personalize an apron with Joy iron-on embroidered letters! Preheat your iron to the cotton setting. Spell out and position the letters for your quote. Cover the letters with a cotton cloth and press for about 30 seconds. Press again from the back of the fabric for another 30 seconds. 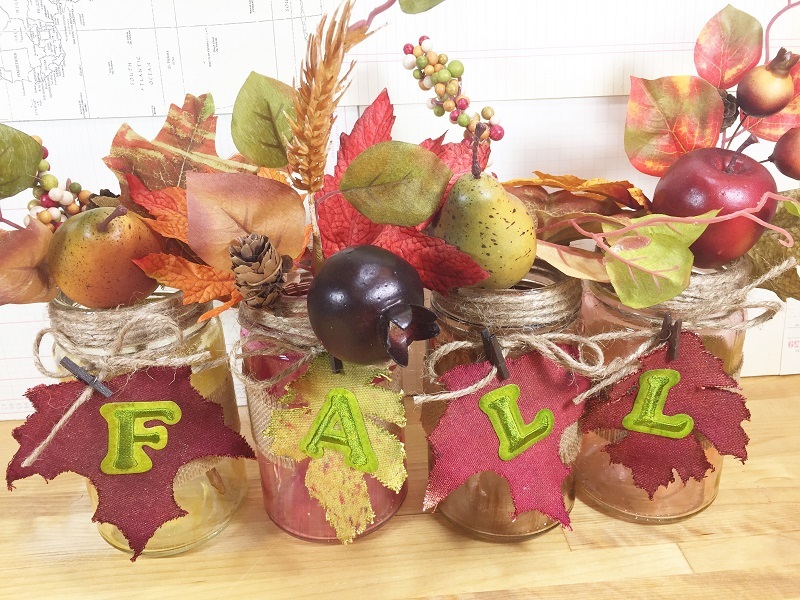 Use mini canvases and JOY embroidered letters to create an easy fall doorhanger. JOY small letters to spell "Fall"
Prepare dye using the instructions on the package. Paint canvases with tan. Let dry and add brown around edges and in center of canvas. Let dry. Dip the letters in orange dye. Let dry and add brown accents as shown. Glue the letters on each canvas. Remove shanks on buttons and glue over letter. 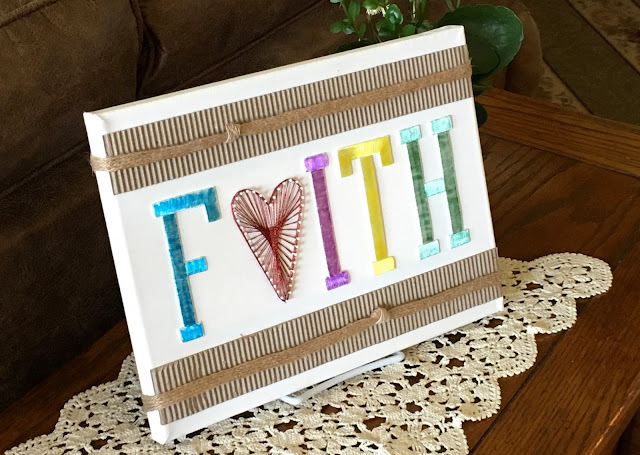 Glue canvases to ribbon. Make a loop in the top of the ribbon for hanging, and trim the bottom of the ribbon into a V-shape. 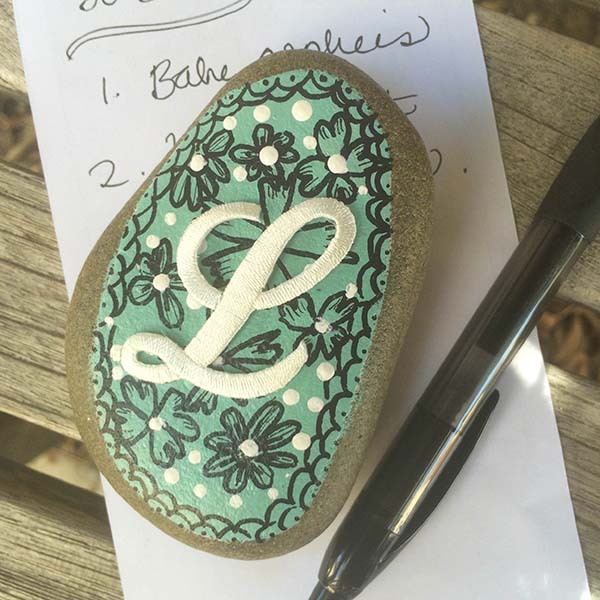 Keep papers from flying away with this monogrammed paperweight. It would make a great gift for the teacher or student in your life! 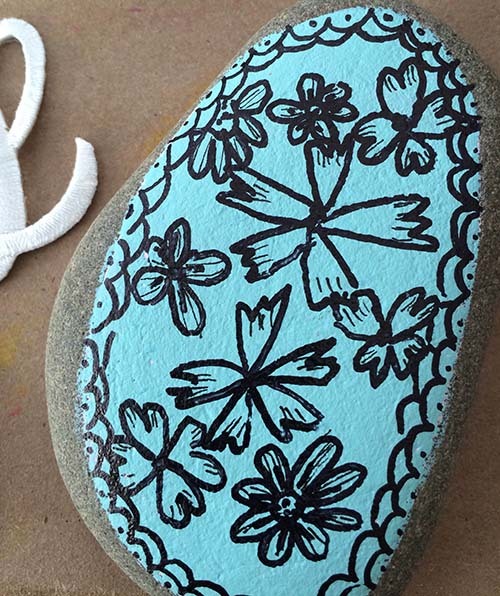 Paint one side of the rock with acrylic craft paint in the color of your choice. Allow to dry completely. Once the painted surface is completely dry, doodle all over it with a marker. If desired, varnish the finished surface to protect it. 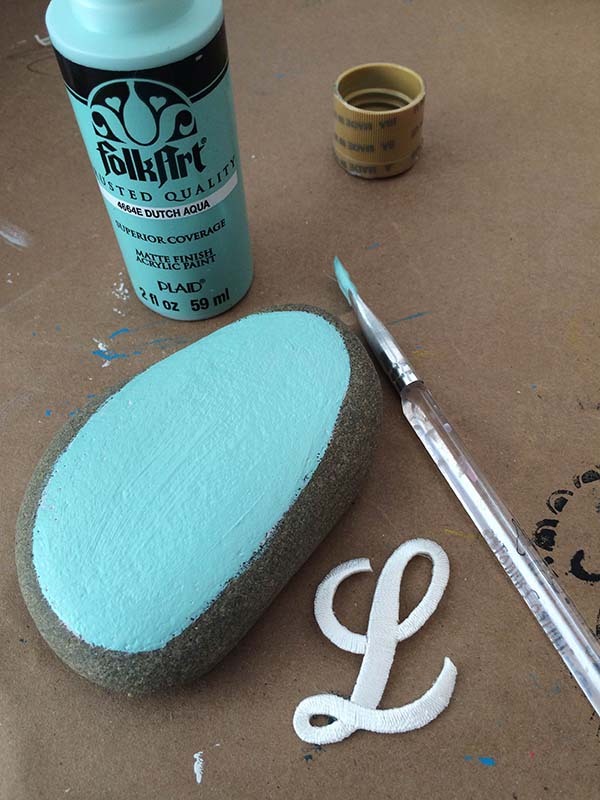 Glue a Joy letter over the design and let dry.